Please feel free to share the following on your blogs. It is a summary of our adoption journey so far. Please help us spread the word. We are hoping somehow someone will be able to help us. Two years ago Greg and I began praying for God to do whatever he wanted with our lives. We handed him a “blank check” so to speak, and told him to cash it. He opened our eyes to children with disabilities wasting away across the ocean in Eastern Europe. We joined God and started our adoption journey. Our family is more than equipped to handle a child with special needs. I have a degree in Early Childhood Education. I am a member of the Board of Directors of Best Buddies of Alabama. I have volunteered for RISE and Eagles’ Wings. All of these organizations serve individuals with special needs. My husband I have close friends and family who have special needs and we are a big part of each other’s lives. Our wedding party included some of these special people. Our involvement with individuals with special needs led us to adopt a child with special needs; specifically, we chose Down Syndrome. As we prayed over the faces of thousands of orphaned children with Down Syndrome, we ultimately chose a little boy named Sergey from Russia. Eight months later, as we neared the finish line of our adoption, one of Sergey’s family members in Russia stepped forward to adopt him. We were heartbroken for our loss, but God showed us that we were following him, and his ways are perfect. We knew we still wanted to adopt, so the way we saw it, two children would find homes because of our journey…Sergey went to his family and now we would choose another child to come into our family. We took great comfort in knowing that God could see this when we first committed to Sergey! We were honored to be a part of his plan. Shortly after losing Sergey, we received a new referral with a grainy photo of a four-year-old blond-haired boy wearing pink glasses named Kirill. We were instantly in love with him. We had to re-file a lot of our paperwork because of the change in referrals and regions of Russia, but we were fast and we thought we were looking at three more months at the most until we would have Kirill home. That was well over a year ago. Since then so many things have happened. A tragic story of an adoptive mother sending her child back to his country alone on a plane with a note pinned to his shirt rocked our world…he was from Russia. Adoptions in Russia came to a screeching halt. Kirill’s region stopped processing adoptions for eight long months. The judge refused to accept any American adoption cases until an official treaty was signed between the United States and Russia. Even though we wouldn’t be able to finalize the adoption in court until the treaty was signed, we were allowed to go visit Kirill and sign our official petition to adopt him in August 2010. We fell more deeply in love with him. This was our son. 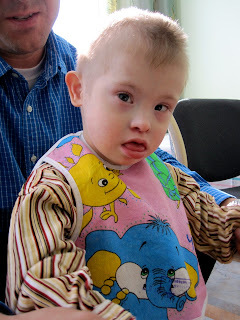 During that time, we found out that Kirill is the first child from his region EVER to be adopted with Down Syndrome. A birth mother keeping her child with Down Syndrome is unheard of in this area of the world. Adoptions of children with Down Syndrome just don’t happen there, these children are literally hidden away from society in orphanages and mental institutions. As our process continued, it became apparent that Kirill would be a pioneer. If our adoption was approved, it would pave the way for other children with special needs to be adopted from this region. Then, a miracle happened around Christmas and the judge in this region suddenly changed her mind and began processing American adoptions again. We were elated. Could this be the light at the end of a very long tunnel? I was somewhat nervous about Kirill being the first child adopted with Down Syndrome from his region, but our agency was very confident that if we got a court date, our adoption would be approved. In seventeen years, they had never had a case rejected IF the family was issued a court date. We were told not to worry, so I didn’t. After meeting the judge’s requests for several supporting court documents, we were finally granted a court date-March 17, 2011. St. Patrick’s Day…I was thrilled. This would be our new favorite holiday! Our son was coming home! Our other son, Clayton, who had just turned three when we started this adoption process, has prayed fervently for his brother. He is now almost five. When we told him Kirill was coming home, oh my…we had an excited big brother on our hands! At one point he even went to his room, dumped out his toy cars and divided them into two stacks…one for him and one for Kirill. Last week, as we sat in the courtroom and suffered through five agonizing hours of difficult questioning, we were not prepared for anything but an approval of our case. Two doctors, two social workers, and the Minister of Children’s Services all made very strong statements on our behalf. They fought for us. Hard. But when the ruling was read, the judge said, “Your application to adopt is rejected.” The basis given was that Kirill was “not socially adaptable” due to his “medical condition” and he was better off in an institution than in a home with a family. As the judge read her ruling, she stated several times that we were a good family, that we met all the criteria to adopt a child, but that she would not approve our adoption because Kirill has Down Syndrome. She told us that we could adopt another child, because legally our application had no problems according to Russian adoption law. She said she would approve our adoption for a “typical” child, but not this child. Why? The only reason? Because he has Down Syndrome. Even though we were approved by our home study and by the USCIS to adopt a child with special needs. It makes no sense whatsoever. Denying a child a family because he has Down Syndrome is a violation of human rights at its most basic level! It was like a terrible dream. We were so unprepared for this outcome. As we left the courthouse in a mental fog, the doctors and social workers that had testified came to us and said, “If you appeal, we will fight for you. Appeal. Fight this decision.” Of course we were going to appeal…I could no more walk away from our biological son, Clayton, at this point. Kirill is just as much my son. So here we are, asking God to move the mountain that is standing between Kirill and us as we appeal to the Supreme Court in Moscow. There are also three other families who are in various stages of adopting children with Down Syndrome from Kirill’s region; one of the families has a court hearing set for next week. We are hoping that someone will hear our outcry and help us bring our son and these other waiting children home. His adoption will set the precedent for many other children in his region. There are 98 children in his orphanage with special needs alone. It is one of many orphanages in this region that houses children with special needs. This is about more than just one child, the lives of hundreds of children with special need are at stake. Please help us. Packing is taking up my blogging time!